SOLAR cells get damaged and lose efficiency from constant exposure to sunlight. Then how is it that plants show little wear and tear though they too capture the Sun’s energy during photosynthesis? The secret lies in the ability of light-capturing molecules in plants to break down and reassemble all the time. Scientists at the Massachusets Institute of Technology (MIT) have managed to copy this constant self-repair process in plants. They have created synthetic molecules that assemble themselves into sunlight harvesting-structures to produce electricity. 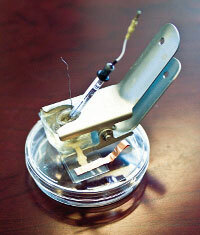 The assembly of molecules or complex could replace conventionally used materials in solar cells. Chemical engineer at MIT, Michael Strano, and his team have described the complex and how it functions in Nature Chemistry on September 5. The complex comprises recombinant proteins, phospholipids, and carbon nanotubes (minuscule wire-like hollow tubes made of carbon atoms). The phospholipids cluster on the surface of a nano tube and provide a platform for a light converting protein isolated from purple bacteria (Rhodobacter sphaeroides). The proteins that attach themselves to the phospholipids act as reaction centres and release electrons when struck by light particles. The electrons are channelised through the carbon nanotube to produce electricity. The complex is kept in a solution that breaks down when surfactant is added. When it is removed, the molecules quickly reassemble to create a new reaction centre. This increased the photoconversion efficiency by 300 per cent. It might be sometime before the technology could be used, as M Irfan Qureshi, assistant professor of biotechnology at Jamia Millia Islamia, pointed out. Such solar cells would require special design; large transparent tanks to keep the solution. But the authors say that once these problems are taken care of the technology would be a boon for developing countries because these systems decrease maintenance cost.